I don’t often include copies in this index, but when you are this far from an original Black Madonna it may be nice to at least visit a copy. For the story of the original in Spain, click here. For the full story of her life in the Philippines, click here and scroll down to "In Naga, the Philippines"
In the Benedictine monastery Santa Maria de los Toldos, Ruta 65, Los Toldos, province Buenos Aires. In 1948, twelve Benedictine monks came from Einsiedeln, Switzerland to the Pampa of Buenos Aires, the rural area of the district, to found a new monastic community. They brought with them an exact copy of the famous Black Madonna of Einsiedeln. It was carved by Brother Simon Welti and painted by Father Bernardo for the people of Argentina. Interesting “coincident” that just at that time surviving Jews, Nazis, and other Germans were coming to Argentina from a totally destroyed Germany. Among them the Black Madonna, whose many faces includes that of reconciler between races*, came to take up her new “throne of mercy”. The Virgin of Einsiedeln was well received. Each year more pilgrims come to pay her homage and to spend a few days in retreat. The liturgy of the monastery copies the one of its Motherhouse in Switzerland with its famous 11th century rendition of the Salve Regina, which is sung at the end of evening prayers. * For more on this subject see the introduction: "The Mysterious Black Faces of the Madonna" and click on the sub heading "Racial explanations". In her church Santa Maria della Libera, life size, 16th century incarnation of an older statue. For two or three hundred years starting during the 9th or 10th centuries, many pilgrims visited the shrine of the Virgin Mary in Moiano, and there were miracles and cures. Then the sanctuary fell into ruin, perhaps due to the plague, but the memory of a miracle working Black Madonna remained until the church and statue could be rebuilt in the 16th century. St. Padre Pio had a great devotion to this Lady. The statue is venerated as a Black Madonna by Catholics and as Mother Lakshmi or the Goddess Kali by Hindus. In her basilica, St. Dominic Parish, Cagayan Apayao Road, Piat. In Tsuruoka Tenshudô Catholic Church, 7-19 Babacho, built in 1896, open 9:00 am - 5:00 pm. 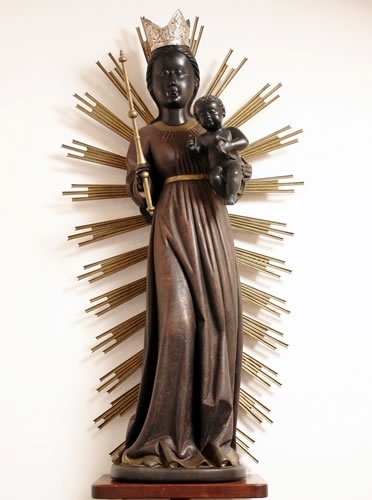 The Black Madonna was a gift from 19th century French missionaries. Antonio Flores Street, in the Ermita district of Manila. For the full history and more photos of this officially Black Madonna go to the beautiful Pintakasi website of James Ben Malabanan. The first church built on this site was the Church of Our Lady (Nagyboldogasszony templom), founded in 1038 by St. Stephen, the first king of Hungary. He "declared the Virgin Queen and Patroness of Hungary, the first monarch so to dedicate his country. "(*1) That church was destroyed by the Mongols in 1241. St. Matthias' church was founded by King Béla IV after the Mongol invaders left Hungary in 1242. Not much remained of the original building due to numerous expansions, wars and reconstructions.